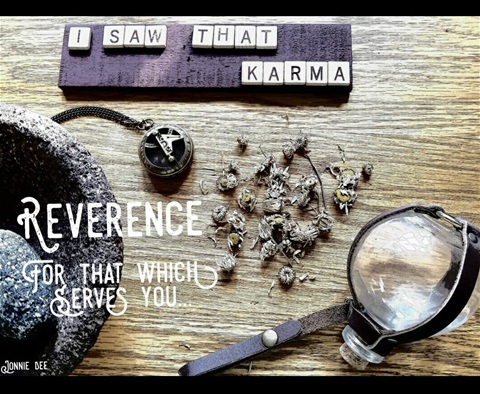 REVERENCE~ I love the word reverence. It means deep respect and to hold in high regard for a person, place or thing. I speak today how I dispose of "spent or used herbs." My children and grandchildren have often questioned me as to why I won't throw the used herbs in the trash. I was taught a long time ago to have reverence and respect for that which serves me. In today's age, respect and reverence seems to have fallen off the wagon and left on the wayside. I share with my grandchildren that reverence and respect are important in our lives. Even so with the herbs. They will decompose and give back to the earth so that it can recycle and give back to us again in the way of rich soil. Our Maker made an amazing ecosystem. Silly, it may seem, but I have a hard time imagining the herbs in a land fill with a metal toaster, a plastic cup and such. So for what it is worth, I share with you my thoughts of how I dispose of my herbs. I often put them in a compost, behind or in the middle of a bush or along the fence line.